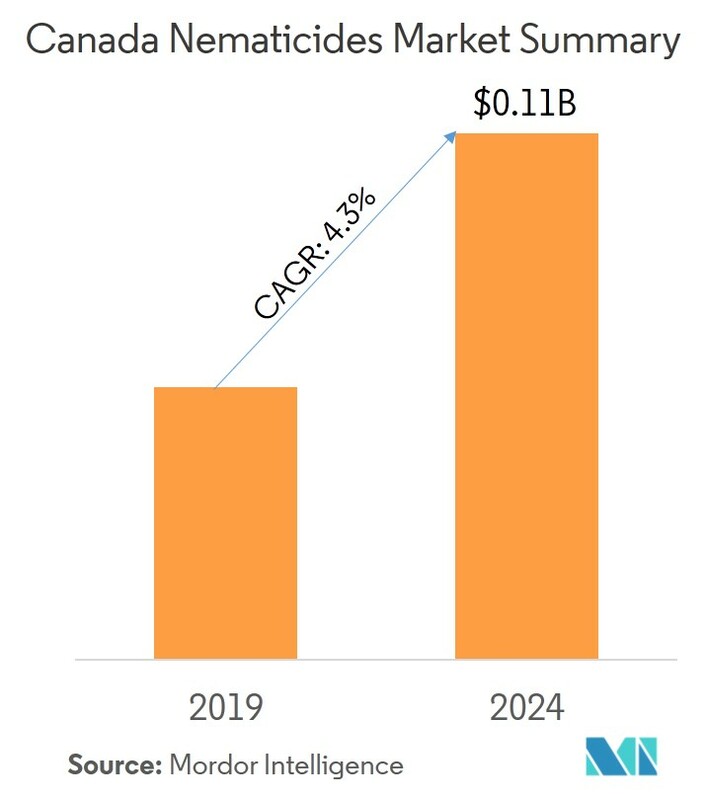 The Canada Nematicides Market was valued at USD 0.09 billion in 2018 and is projected to grow at a CAGR of 4.3% during the forecast period (2019-2024). The market is segmented by chemical type (fumigants, organophosphate, carbamates, bio-based nematicides, others) and by application type (grains & cereals, pulses & oilseeds, fruits & vegetables, commercial crops, turf & ornamentals). 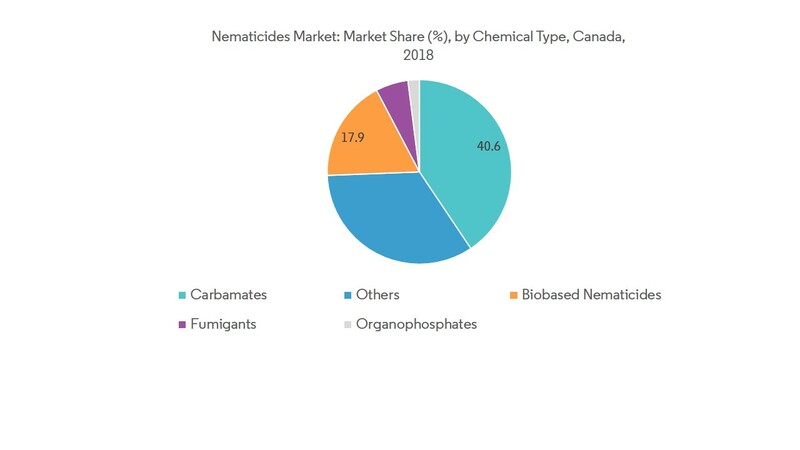 The Canada Nematicides Market was valued at USD 0.09 billion in 2018 and is expected to register a CAGR of 4.3% during the forecast period (2019-2024). Approximately 15-20% of the crop loss in Canada is due to nematodes and almost every crop in Canada is affected by nematodes. To avoid crop losses, the demand for nematicides is growing at a high rate in the region.Although,Canada is a net exporter of agricultural products, the demand for agricultural products has been increasing. The increasing demand, coupled with the heavy crop losses in recent times, has posed a greater challenge to the farming community. The crop losses are due to the presence of nematodes, which were found in recent times. Nematicides are the chemical substances that are used to kill nematodes in farmland. 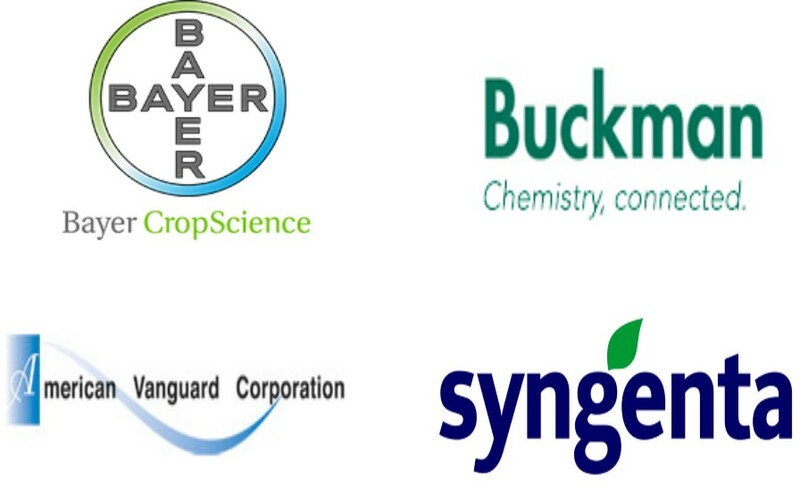 Nematodes are parasites of plants, which can infest all parts of the plant, leading to severe crop damage.In this report, the market has been segmented on the basis of chemical type and its application with special focus on the Canadian market. Crops, like potato, carrot, cucurbits, and fruiting vegetables have been given special attention.The report presents an analysis of production, and the area under treatment for a particular crop. The market operates at a B2C level and this has been taken into consideration while carrying out a holistic analysis based on numerous factors. Modern agriculture depends mainly on four factors viz: water, fertilizer, seeds, and pesticides. Pesticides have become an integral part of modern agriculture. In Canada, an average of 15-20% of the crop is lost due to insects, weeds, and diseases. To avoid the huge losses in crop, pesticide usage is a must.The per-capita consumption of pesticide in Canada is 1-2 kg/ha, whereas, it is 13kg/ha in China and 7kg/ha in the United States.The main reason for the lower consumption of pesticide is due to adverse effects on human life and the government’s discouragement of the use of chemical pesticide. As the arable land per capita reduces, the per-capita pesticide usage may further decline.However, focus on food security and safety will increase the potential of the pesticide market, with focus on bio products. 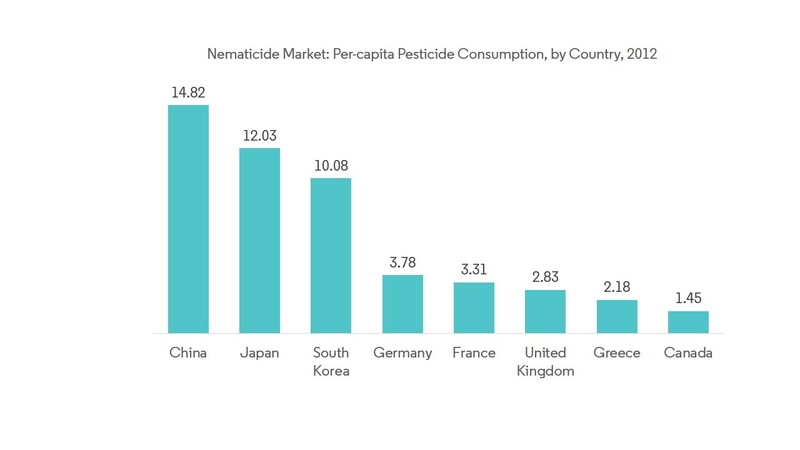 On the basis of chemicals, nematicides can be segmented into: fumigants, organophosphates, carbamates, bio-based nematicides, etc.The carbamate-based nematicides occupy the largest market share in the Canadian nematicide market, followed by nematicides with other chemical types, such as benzamides, phosphides, carbides, pyrroles, and silicides.Adoption of integrated pest management techniques is increasing the market share of the bio-based nematicides segment, which is estimated to be the fastest-growing segment during the forecast period, which is anticipated to grow at a CAGR of 7%. 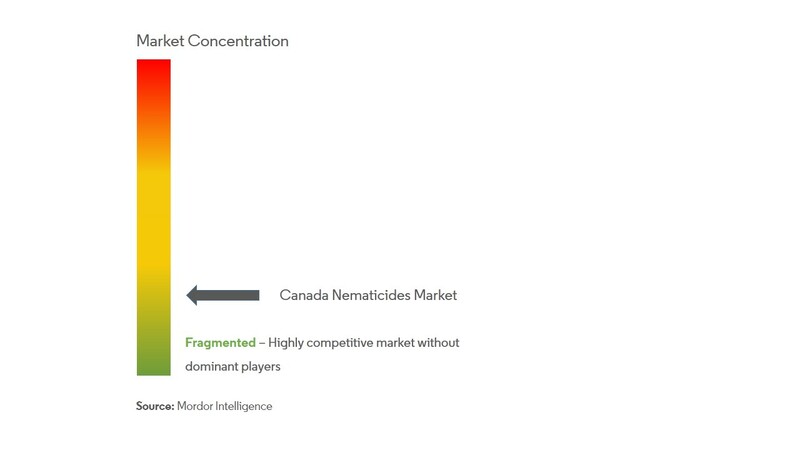 In the Canadian nematicide market, companies not only compete on product quality or product promotion but also focus on strategic moves to acquire greater market share. The players in the market are investing heavily in this market, in order to diversify their biological research divisions for bio-based nematicides.The results of market share analysis indicate a highly-fragmented Canadian nematicide market. Many small players occupy major portion of the market, with top players having a diverse and growing product portfolio. 6.3.8 Buckman Laboratories International Inc.
6.3.10 Marrone Bio Innovations Inc.